As we roll into 2015, GreenSQL provides a review of the top methods organizations need to implement in order to protect their databases. While Microsoft’s documentation does a great job covering best practices for database programmers, that is still not enough to protect against many of today’s threats. In fact, as many as 65% of database breaches are inside jobs, that is, they are performed by someone who is authorized to access the database. Fortunately, by taking appropriate precautions, most of these breaches can be prevented or detected before they cause damage. 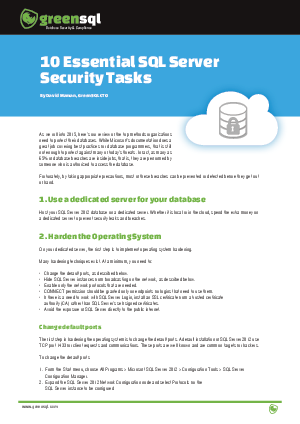 Download this guide to understand the threats and learn the 10 essential SQL server security tasks to prevent and detect breaches.